I will begin with a tale. Its plot centers on a woman and poet known as Tahereh. Tahereh was not her real name; it was the title bestowed on her by Bab, a religious leader and the precursor of the Baha'i faith in Iran. It means "the pure." Tahereh was born in Qazvin, Iran, in 1814, to a well-known and influential clerical family. She lived at a time in Iran when clerics and depots shared power and the "law" was religious law. Perhaps the best way to judge that time is by its rules regarding women. Women were veiled from head to toe, and when talking to men who were not members of their immediate family or their husbands, they had to hide behind a curtain. Polygamy was an accepted practice, women's age of consent for marriage was nine, the punishment for adultery was death by stoning, and women's public education was banned. Because of her father's enlightened views, Tahereh and her sister were allowed to continue their studies under his and his brother's tutelage. Tahereh's exceptional talent and zeal for knowledge matched her extraordinary beauty. Despite the high degree of her scholarship and attainments, she was given in marriage to her cousin at the age of 14. Marriage to a husband from an orthodox and highly religious family, and the birth of two sons, did not deter Tahereh from her studies. As a result of those studies, she became attached to the teachings of the most controversial religious leaders of her time, the Babis. At a time when women were not allowed to leave their house without their husband's permission. Tahereh left her husband and family and became one of the Babi movement's most effective and outspoken leaders. She urged radical changes in religious doctrines that she insisted must change and be renewed with time. She was so effective an orator that wherever she went she gathered large followings, especially among women. The followers of Bab and later of Bahaullah posed a dangerous threat to Iran's powerful Islamic clergy, and Tahereh became a particular threat. In the year 1848, at a gathering of babi followers in the hamlet of Badasht, Tahereh appeared unveiled, and abrogating the laws of Islam, proclaimed the advent of a new faith. "Consternation immediately seized the entire gathering....To behold her face unveiled was to them inconceivable." Many men escaped in horror, and one slashed his throat at such an act of sacrilege by a woman. It was then that the Babis announced their independence from Islam, and proclaimed their faith as a new faith. Tahere's unveiling became synonymous with the abrogation of Islamic law. To the followers of her abandoned faith she was worse than a heathen; she was a heretic, the evil "Other" who had betrayed her own. To her followers she was an enigma, a puzzle to be worshipped without being understood. Not surprisingly, Tahereh was soon put under house arrest. The tale ends with her death. The government, too apprehensive about executing her publicly, secretly planned her death and had her strangled. This article is not about Tahereh's Babi movement. Rather it is about Tahereh's great granddaughters and great great granddaughters living in a country now called the Islamic Republic of Iran (Islamic Republic). Tahereh's legend is the context that will make these women's lives understandable. 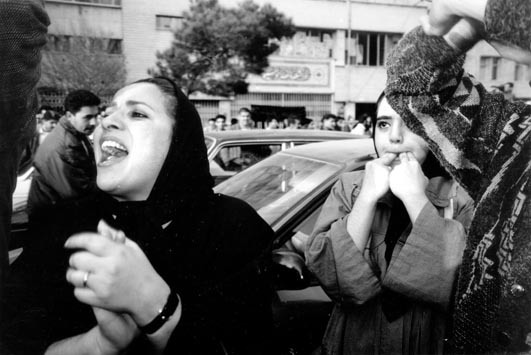 The image of Tahereh in Badasht now haunts the Islamic Republic. As an Iranian woman living in the Islamic Republic until 1997, I often felt that a time warp had occurred and I was back to living in Tahereh's times. Understanding women's lives in the Islamic Republic and their resistance to fundamentalism starts with understanding the past, and in finding answers to the questions raised by Tahereh's tale: Why did Tahereh have to be taken away and killed secretly? What danger did a single woman present to those powerful men? Why did a man kill himself because she lived the way she did?